You guys know me and you know I like my cars to look a certain way. And by certain way I mean clean paint with a good shine and when you touch it is feels soft and silky. Roxy was like this almost always, and Bruce was too. I finally got the chance to do that with the Roadster, and I have assigned him a name. Unlike Bruce, this MINI did not have any of that crappy clear bra and old, brittle vinyl stripes (or 69’ing lizards on the roof). In fact, again unlike Bruce, this MINI has been much better cared for. Probably professionally detailed at least once, maybe more. Definitely garaged. Here is what I did to him today. After using clay on the paint, it was practically clean when I was done. Definitely had this done before, and sometime this year more than likely. I was really amazed. I polished the boot and bonnet because, at least to me, the paint was looking a bit dull. The DA brought it right out! And, if I can say a word or two about 303. Quite possibly my new favorite thing! After I used it on the top and was shocked at how good it made it look, I went ahead and used it on the plastic trim, door panels and dash. I’m normally an Armorall guy, but this stuff has changed me! Easier to apply and it looks better after. Sure, I don’t get the shine, but it makes that stuff look black. Like, really black. Like brand new on the dealer lot black. And now he is ready for AMVIV. And a proper photo shoot that I expect to be doing this weekend. I’ll let you guys know when those photos go up on Flickr. Took longer than I wanted to get this done, but did my first drive way wash with the new Roadster this weekend. Nothing fancy, just a bucket and a hose. And I have some notes. The top is in desperate need of some 303. It acted like a sponge when the water hit it. Overall, the paint is in pretty good shape. I did find a couple of small dents but nothing to get in a snit over. Unlike the last MINI, this one has been taken care of on the outside. It might have been awhile, but it has seen the business end of claybar. So. Much. Chrome. Seriously, this car has more chrome than my ’65 El Camino. Most of it is ok, but some bits need polishing*. Black Conical Spoke wheels are super easy to clean. With AMVIV coming up next month, I still have plenty of time to get him a full detail. Clay bar, a little polish (boot and bonnet need the machine) and a coat or 2 of NXT. When last we met, you already knew that I was trying to get out of Bruce and into something different. If you play the DonBurnside™ home game, you already know what happened. But, because I’m a giant nerd and am feeling the need to write, you get the words. I did a bit more research on this guy before I rolled in. Our man Brian Dallas hooked me up with a full VIN history (this MINI is very well taken care of). With that, and other research that shows this MINI started life as a MINIUSA mule (possible press car), and that it was CPOd when acquired by a local dealer, I was in good shape. For the financing, let’s just say I got a proper APR this time around. Not as good as it can be, but really close. Close enough that you would be impressed. Oh yea, the car. 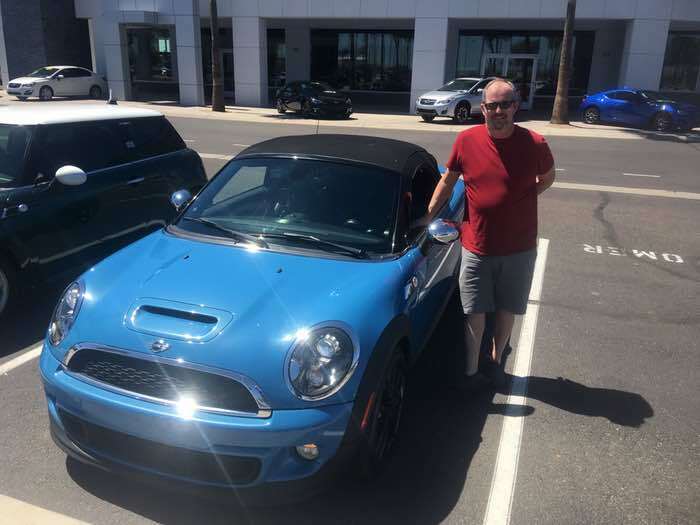 It’s a 2013 MINI Cooper Roadster S. The original sticker price on this MINI was right at $40K when it was new, which means it is loaded. And, when I say loaded, it really has all the things. The color is called Kite Blue and it is quite striking no matter how you look at it. So, here’s the thing there. Since 2003 I have driven MINIs with Manual transmissions. In rain, in sleet, in snow, across the US and on F1 circuits in Europe. Awesome times. Until it comes time to use this car for actual transportation back and forth to work. My current commute is a 20 mile crawl that usually takes me about an hour each direction. And I’m over the whole shifting thing in traffic. Seriously. Over. It. That plus some medical things make the automatic a good choice for me at this time. I’ve only spent a few hours with it so far but can tell you it is a joy to drive. The last roadster I drove was the MotoringFile company car, which was a JCW. While that car was a blast to drive, I am finding the standard S to be slightly more forgiving and joyous for normal driving. A quick shout-out to my squad for the sounding board and advice when it came time to start dropping offers. The slack channel was very busy for a few days! While no mechanical mods are planned, I am in agreement with the boys about this. So. Much. Chrome. AMVIV is coming up which means Todd will be performing some black-out magic and, very possibly, some stripes. This is a repost from earlier this week. The post has also been updated. After spending a bit more than 30K miles in Bruce since I bought him about 2 years ago, it was time to do the next modification. It’s the same mod that I did to Roxy at about 27K miles and that was a full brake job, adding EBC Green Stuff brakes and replacement rotors. Also, for something different, I went ahead and had the brakes installed. All 4 wheels were needed and I really hate doing the rears. Besides that, he was also due for an oil change and alignment as well as trip on the lift just to take a peek and make sure everything was ok. The old brakes were OEM and I might have waited about 10K miles too long to get them done. The fronts were almost metal to metal and one of the rotors, from what I could tell, was slightly warped. In case you are wondering, but I don’t recommend this, OEM brakes are good for about 60K miles if you really need to push it. The alignment was also something I was way overdue in getting taking care of. Since I have no idea about the history of this MINI, it’s nice to get this work done. It’s almost like a bit of a factory reset. The only thing left is the check engine light fix and to replace the front chin spoiler, both of which will be happening, hopefully, by the end of February or early March. With AMVIV coming up, there are still 2 more things I need to do. Replace the chin spoiler (parts are waiting for me to order at OutMotoring and get the CEL fixed. Jerry knows the fix, just a matter of getting it done.